Often, simple examples illustrate important principles. This article is about one of those examples. It involves a real café, near a major university in London, which did a brilliant job of designing the layout for fast, efficient and low-hassle use. The key concepts behind this apply just as much to design of huge buildings as to tiny cafés. 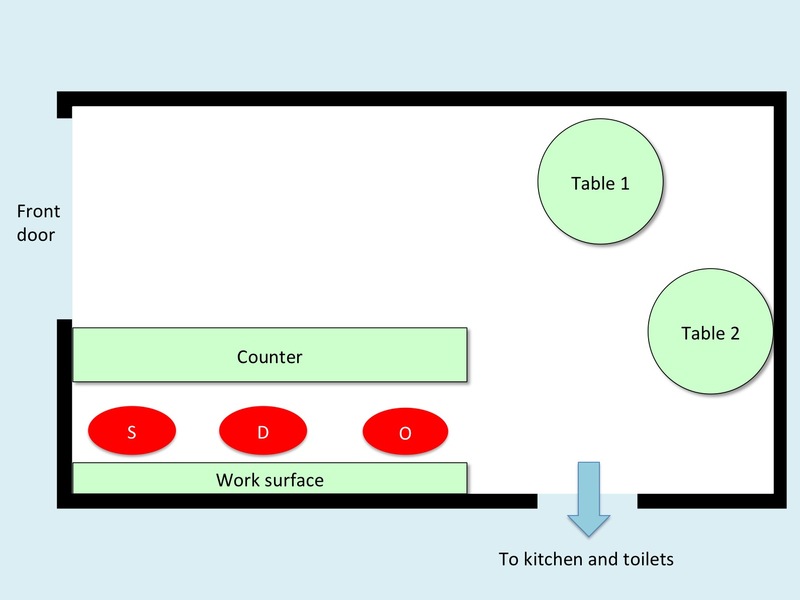 I’ve used the café as a worked example of how simple task analysis, hassle analysis and design rationale can make produce an outcome that is good for everyone involved. The café is tiny. It has a service counter on the right as you go in. 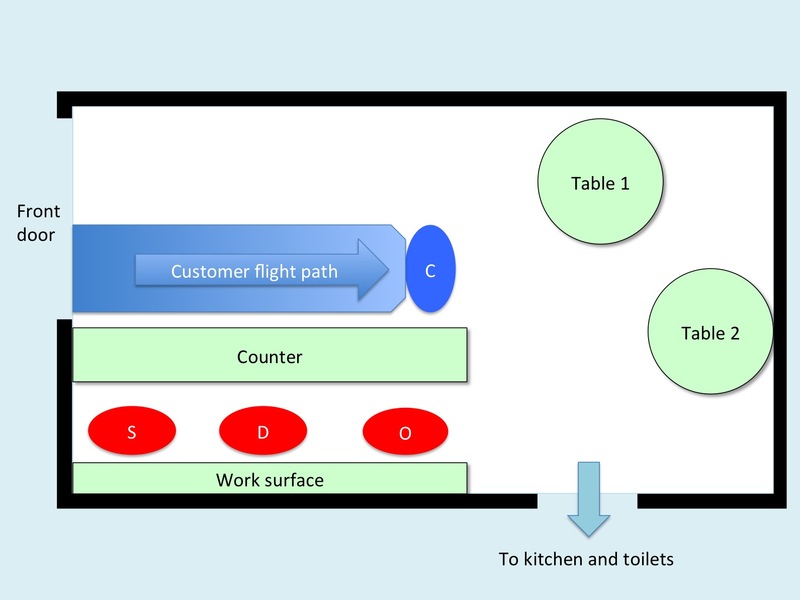 There’s a door to the kitchen and toilets beyond the service counter, and there are a couple of small tables at the back. That’s about all there is. A lot of the trade is university staff and students who want take-away coffee and sandwiches, and who want fast service. So why is the design so good? Here’s a schematic plan of the interior. The first thing to note is the layout of the three staff behind the counter. There’s the sandwich guy (red oval labelled “S”) nearest the door. Next is the drinks woman (“R”). Furthest from the door is the woman who takes the orders and the money (“O”). That’s a counter-intuitive layout. The person who takes the orders is the furthest away from you when you come through the door, whereas you might expect her to be the nearest. There’s a good reason. This is an example of what’s called a blocking function in Human-Computer Interaction (HCI) design language. A blocking function is there to stop you from doing something. Blocking functions can be used in various ways. Sometimes they’re only intended to stop you for a few seconds, while something else happens, as in this example. Sometimes they’re intended to make you stop and think about whether you really want to do something; for example the glass over fire alarms. Sometimes they’re intended to stop you completely from doing something really inadvisable, like opening a passenger aircraft door at high altitude. In the case of the café, it makes a lot of sense to put in a blocking function. The sequence of actions is as follows. The customer goes into the café. We’ll assume that there is another customer already at the counter being served. The woman who takes the orders makes eye contact with the newly-arrived customer, and asks what they would like, then tells them the cost. Because the café is so small, it’s feasible to do this without having to shout. The woman who takes the orders then tells the sandwich guy and the drinks woman what to prepare. This lets them focus on the sandwiches and drinks, without also having to deal with the customers. The previous customer is being served while this happens. The new customer gets out their purse/wallet while the previous customer is being served, and has the money ready by the time they reach the till. The new customer pays the bill, accepts any change, and puts their wallet/purse away. They wait while the sandwich and the drink arrive. They pick up the sandwich and drink, and either go to a table or to the exit. This is a neat sequence because it lets the customer do all the tasks one at a time, without hurries or hassles. The elegance only emerges when you stop and think about it. In this arrangement, you get time to take out your money before you reach the till. You get your change, put it away, and then have both hands free when the sandwich and coffee arrive. That’s much easier than being given your change and the sandwich and the coffee all at the same time, which most people find flustering. Another neat feature of this design is that it automatically produces an elegant flow of traffic within the space. Here’s how that works. When you’ve been served, you usually can’t double back, because there are customers behind you, acting as a natural blocking function. So you’re at a decision point. Nobody is likely to be pushing past you for a few seconds, because it will take at least that long to serve the person behind you. If you want to exit, the route is obvious. You go out along the far wall from the counter, like this. If you decide that you want a table, you go forward. 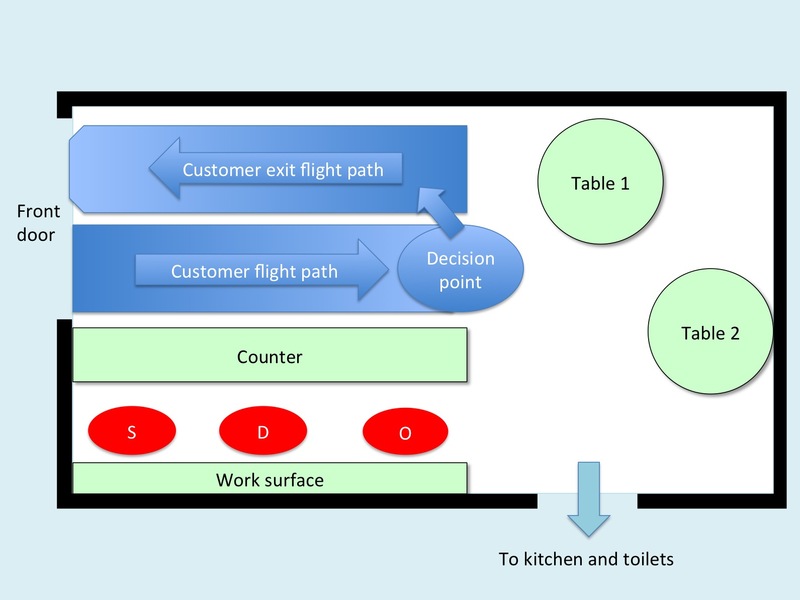 If someone is leaving a table, there’s just enough space for them to get past you onto the exit flight path, without a collision. If someone is emerging from the toilets, they can wait behind you, next to the counter, while you move to your destination. This design produces a nice, clean flow of traffic, because of the inbuilt system constraints. There’s just enough space for the incoming flight path and the outward flight path to pass each other without collisions. There will often be people standing still at the decision point, which gives traffic from other directions a chance to join the flow easily. The tables are at the end of the room, so anyone leaving the tables will naturally be funnelled towards the slow spot at the decision point. This means that they can join the exit flight path at a comfortable pace, rather than having to squeeze into a moving queue. Overall, it’s a beautifully efficient design that channels customers into a route that minimises hassles, produces a smooth flow of traffic, and makes excellent use of a very small space. There are a lot of regularities in how people use space, and how they do small everyday tasks like getting their money out to pay a bill. If you factor these into a building design or an interior layout, then you can make the space much easier and more pleasant to use. This is very different from a building-centred design approach, where the starting point is the building itself, rather than the ways in which the human beings will use it. A good place to start reading about these regularities is a book by Paco Underhill called Why We Buy. It’s highly readable, as well as deeply insightful. Underhill is an anthropologist who studies people’s behaviour when shopping. He spotted regularities such as what he calls the landing zone in a building. Usually, when a person goes into a building, they slow down over the next few paces, and do perfectly reasonable things such as opening their coat, or checking their bag, or getting out a shopping list. You can make life easier for people using a building by incorporating a landing zone off to one side of the main flight path into the building. 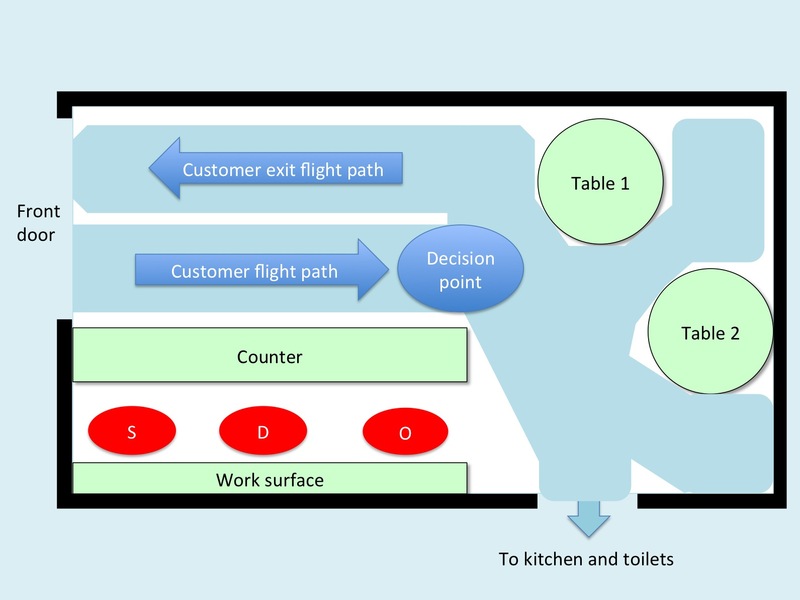 This lets people take a couple of steps to the side, sort themselves out, and then rejoin the flight path, rather than slowing down and causing delays and obstructions to people behind them. There are numerous other examples of how attention to human behaviour can make a design much more easy and pleasant to use. Although user-centred design is simple, and grounded solidly in detailed observation of what people actually do, it’s not as widely known as it should be. We’ll return to this approach in later articles. This entry was posted in aesthetics, design, development methods, requirements and tagged ergonomics, foot traffic, spatial design, task analysis, traffic flow, use of space, user centred design by hydeandrugg. Bookmark the permalink.